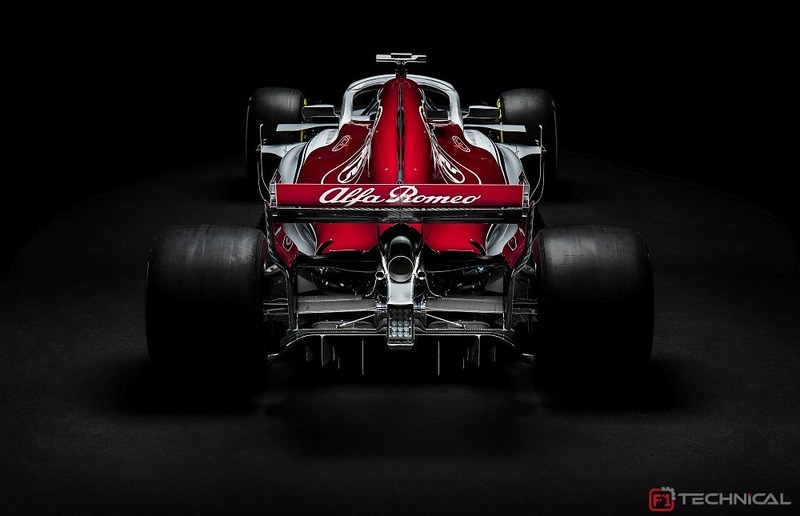 Few could have predicted the outcome of Sauber's car launch, but in reality, the car that is officially named Alfa Romeo Sauber C37 turned out to be one of the most interesting of the launched cars thus far. Not because of its (arguably) beautiful livery, but because the design team have chosen not to go into the footsteps of others, but rather find what could be different to improve the car overall. Obviously, last year's C36 wasn't a great success, with the team first finding out they had taken into account too much cooling capacity, making them drive around with too much weight under the covers. And when that eventually got sorted, the team was left disappointed by the lack of serious improvement, which was later attributed to their failure to get the Pirelli tyres to work. So, the Sauber found a new investor, signed a deal with Ferrari that included branding for Alfa Romeo and up to date Ferrari engines. Along with it came a Ferrari gearbox as well, plus the Ferrari rear suspension, which has moved the rear wheels 40mm backwards, relative to the chassis. This means little change in supplier of the drivetrain components, but obviously a major boost thanks to a 2018 spec power unit compared to the outdated 2016 version - which the team said it opted for due to it being the easier to integrate. Now for the visual items. 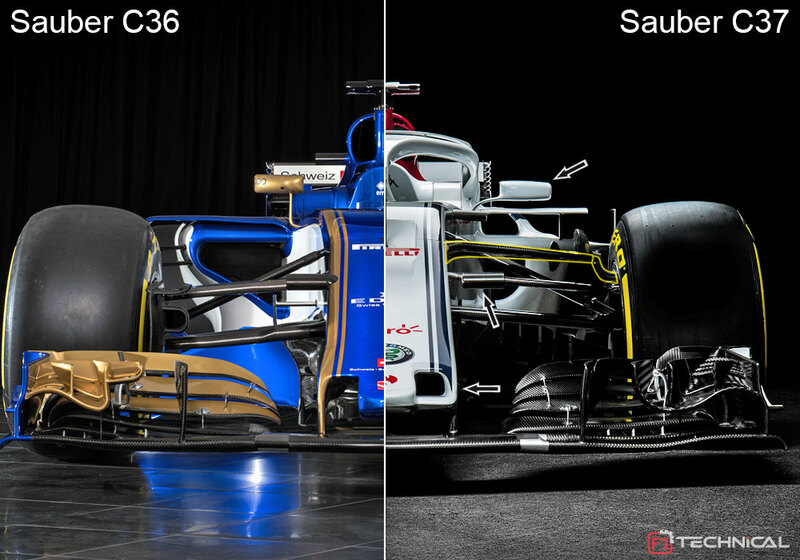 It is obvious, and confirmed by the team's technical chief Jorg Zänder, that Sauber have gone for a totally different approach, even though some elements still come back from the C36. If we ignore the front wing for now - likely to get upgraded soon anyway - the nose cone is still a thumb nose design, an approach that most teams seem to favor recently. However, on the Sauber C37, it uniquely features two apertures, one on each side of the thumb section. It is of course not a certainty yet where these air inlets lead to, and it could be that they simply vent out underneath the nose cone, like was the case on the Force India VJM10, but it could very well be that these are the inlets for the S-duct. The latter similarly sports two outlets, one ahead and one aft the Pirelli logo painted on the nose. The dent in the nose just ahead of the first outlet helps empower the S-duct air stream, and is a feature that was also seen on the Sauber C32 of the 2013 season. Again, this is a unique solution, with no team yet having come up with S-duct exits that lie one behind another. The disadvantage here may be that there is less of an opening between the front wing and the tip of the nose. While this may compromise airflow underneath the nose section, Sauber appears to have found it a worthwhile change. From the front view, one can also immediately devise the changes made to the front suspension. Sauber has, just like Red Bull Racing did, somewhat copied a Mercedes solution from 2017 by moving the upper wishbones higher up. At the wheel, these now connect to an extension of the upright, higher than the uppermost point of the upright itself. The lower wishbones were similarly moved up, but slightly less, resulting in an increased gap between upper and lower wishbones, and theoretically therefore also more rigidity - which may be offset by introducing the pivot anchor for the upper wishbones. Zänder also confirmed that the front wheels are moved slightly ahead as well "to create more room behind them, in order to create more freedom for the aerodynamics in the area between the front wheels and sidepods". Slightly further backward, the Halo takes a dominant position in the look of the car. The standard titanium bars are painted white, with an added small winglet at the top to control airflow. To prevent a loss of rear visibility, the mirrors were repositioned lower and further outboard as well. Likely influenced by the Halo, but clearly building onto the 2017 concept as the airbox. It is another unique solution where the C37 features a roll blade, just like its predecessor. Things have become a little more complicated though, with the inlets on each side of the blade paired with another underneath. Behind these 4 inlets, another aperture reaches over the arch of the bodywork, likely an inlet to feed the oil cooler that is commonly positioned above the gearbox. The total dimensions of the inlet seem to be similar to last year. Even further back, there's another pair of inlets, one on each side of what's left of the shark fin. This feature was also seen at several venues last year on the C36 to provide extra cooling of the car's internals. The real differentiator with other cars however seems to be the shape of the sidepods. Where the C36 had very conventional sidepods, and initially also large inlet openings, the new C37 has considerably smaller inlets, catching all airflow closely to the chassis. The philosophy is entirely different from Ferrari's solution on the SF70H where they went for a wide and shallow inlet. 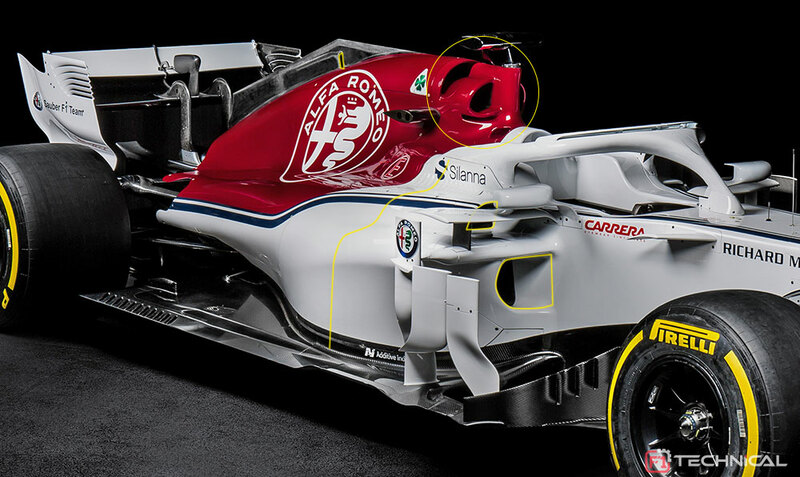 As Sauber is also aware that Ferrari was onto something last year, the main inlet is paired with another one, just aside of the cockpit shoulders and slightly downstream of the main inlets. The solution is very similar to that seen on the Benetton B188 from 1989, but more neatly integrated into the car. The shape of these two inlets appear to determine the dimensions of the sidepods further downstream, with an interesting curve that can only really be appreciated when looking at it from the back of the car. Further back, the sidepods remain high, with a large undercut to optimise the diffuser. This creates a fairly wide opening at the back of the car, and is by no means as compact as the back end of any of the recent Red Bull Racing cars. The launched C37 car also features a double swan-neck support for the rear wing, mounted on two metallic supports in between which the exhaust pipe goes. Outboard of the supports and pillars are the small exhausts for the pop-off valve. Looking from the back, it is also clear that the exhaust pipe is fairly short as the team tries to extract a bit of downforce from the exhaust flow with a flip-up over the rear crash structure. Overall, the Sauber looks like a thoroughly engineered car, but one wonders if some solutions could not have been possible with more simplicity. The Red Bulls of Adrian Newey for instance have always been an example of this, with minimizing bodywork surface on the sidepods. Time will tell, but this car certainly shows that Sauber's engineering team has been hard at work over the winter.